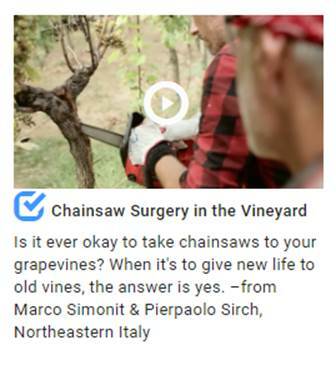 “Chainsaw Surgery in the Vineyard” is one of 10 finalists of the Wine Spectator Video Contest. In August, we entered our video into the Wine Spectator Video Contest. The finalists were just announced and the “Chainsaw Surgery in the Vineyard” video is one of 10 finalists! Online voting is open to the public now! Click the link here winespectator.com/videovoting to watch the video and vote. Select the box next to the title of your favorite video. Click the “Vote For Your Favorite” button, located directly below the videos. Invite your accounts, friends and family members to vote as well! You can vote multiple times! Voting is open now through Sept. 17. Vote from work, vote from home, vote from your phone, your iPad! The winning video will be announced Sept. 19 (and the winning video will be screened at the Wine Spectator New York Wine Experience).